Streuter Technologies offers several different adhesive solutions for mosaic artists. Each one was developed for a specific use. So how do you know which one you should use? 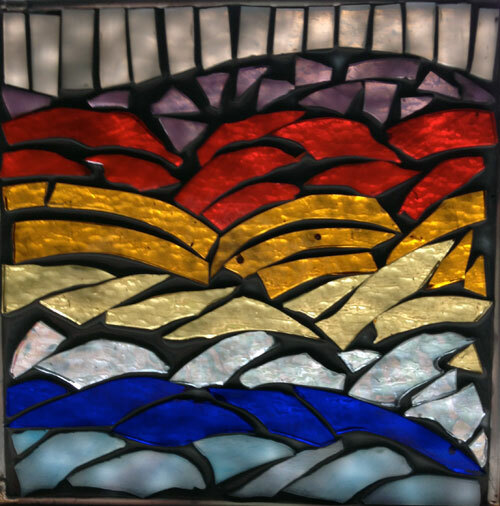 This post will hopefully help you to answer that question, specifically for Glass on Glass mosaics. 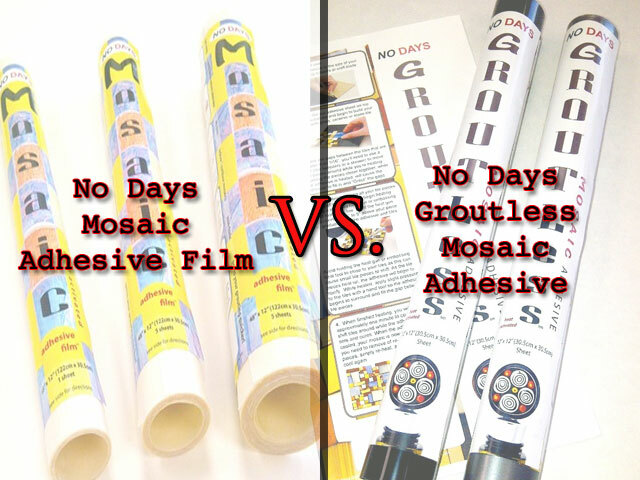 No Days Mosaic Adhesive film vs. No Days Groutless Mosaic Adhesive. 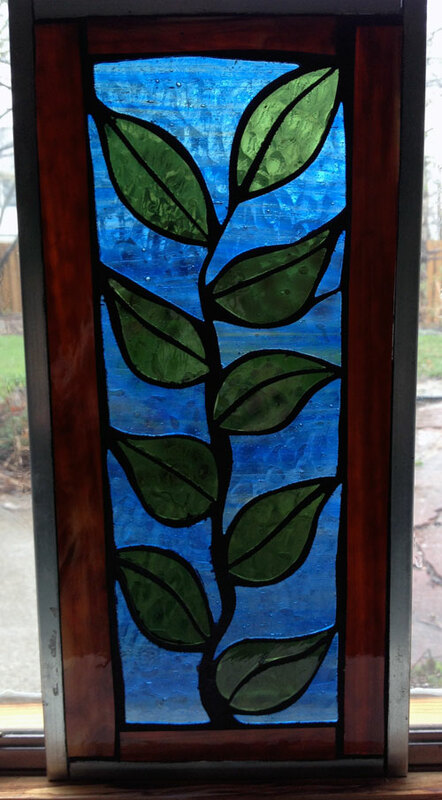 The stained glass looking window above was created using the No Days Mosaic Adhesive film. No Days Mosaic Adhesive Film is dry-to-the-touch and comes in rolls of thin, film sheets that can be cut to size. It comes in “clear,” which has a yellowish tint to it. 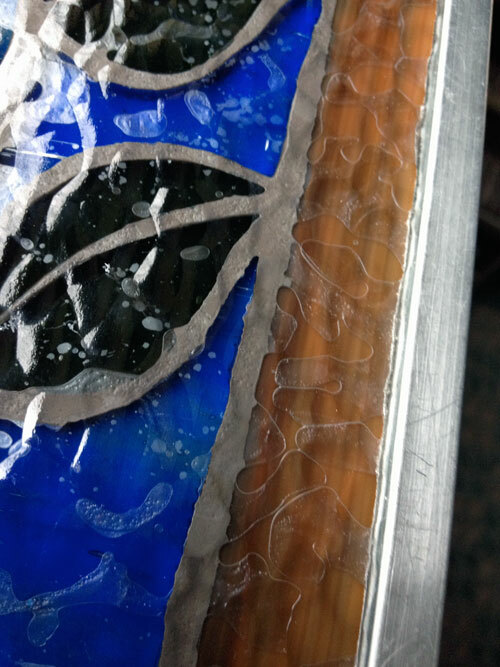 The base of the mosaic is a clear piece of hammered stained glass. 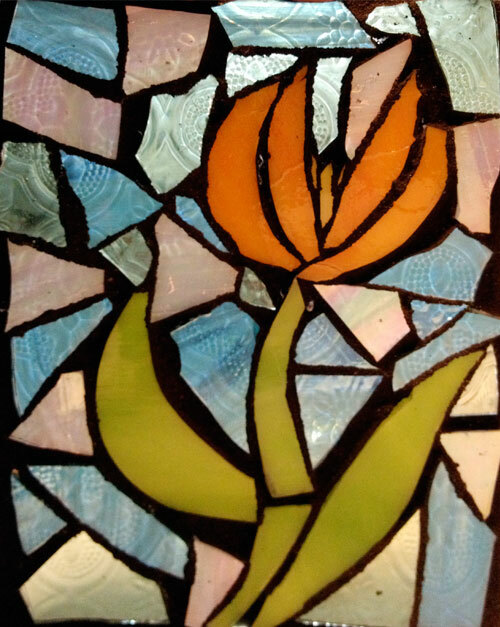 Even though one side is “flat,” there is still texture to the flat side, additionally, the stained glass pieces that I cut to shape and laid down on top also have texture to them. What does this mean? 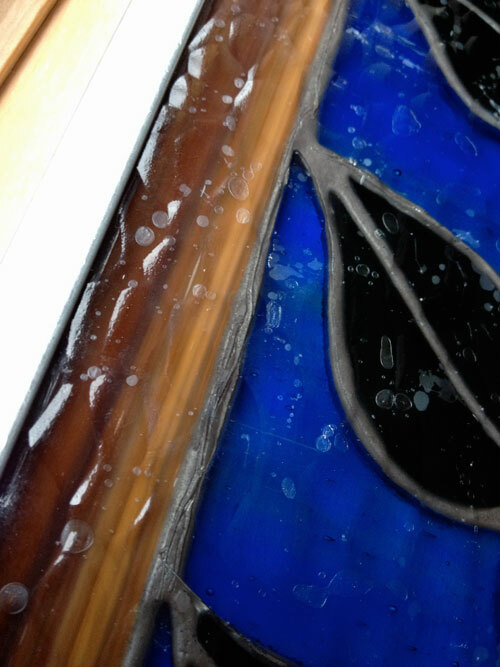 You can, however, layer the sheets of adhesive film between the base layer of glass and the pieces you put on top. This helps the adhesive to flow into the voids between the glass when it’s heated. 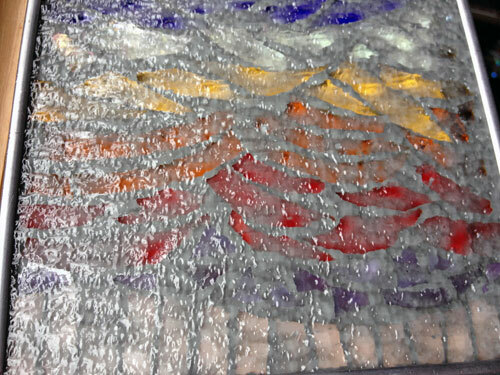 The photo above and below show what happens when multiple layers of the No Days Mosaic Adhesive film are used. On one half of the leaf mosaic, I used 2 layers of adhesive film and the other half used 3 layers of adhesive film. 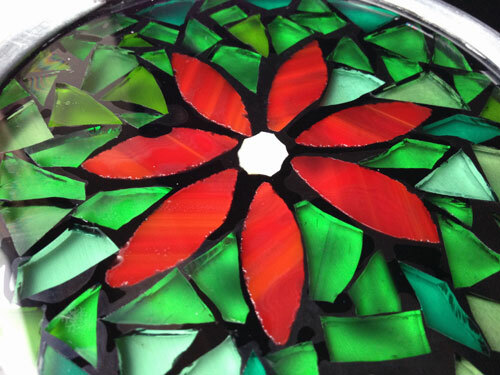 The glass on glass mosaic above and below was made using the black Groutless. I used approximately one and a half layers of the Groutless: one full layer and then bits of it placed here and there. 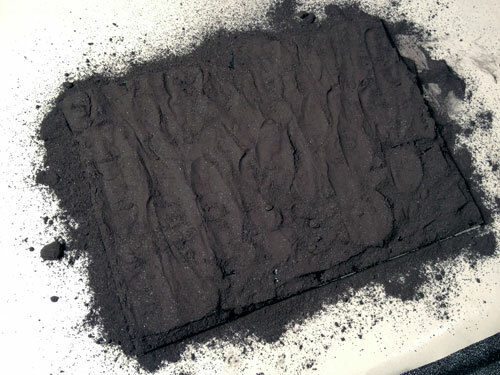 Before heat setting, the black is opaque and you can’t see through the glass pieces. 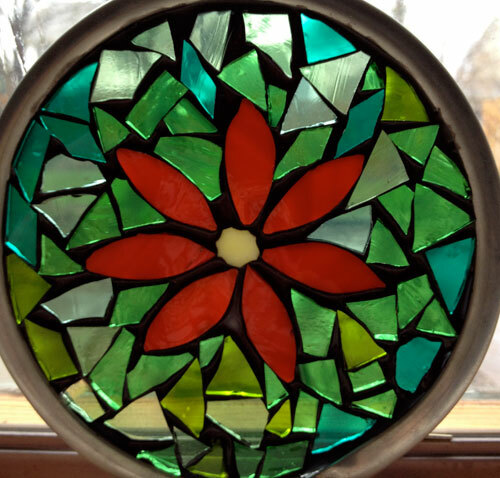 However, after heating and pushing down on the pieces, they become “clear.” I used plate glass as my base for the red flower mosaic. Plate glass is flat on both sides, so I was able to push out nearly all of the adhesive. For the last glass on glass mosaic, I’m using the clear Groutless, AND I’m going to share a little trick for making the Groutless look like real grout! Heat setting the Groutless Mosaic Adhesive using an electric skillet. So, all of my pieces are in place and above you can see the glass on my cheap, electric skillet. 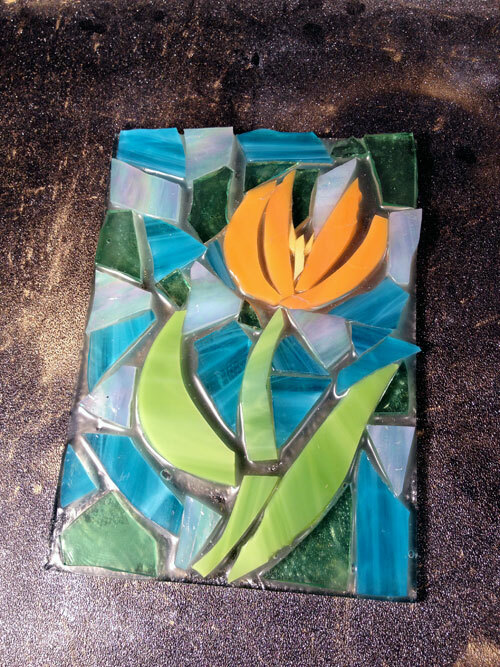 (I love using my electric skillet for glass on glass mosaics and when using Groutless to create jewelry with bezel pendants.) I set the skillet to 200 degrees F (93 d C) and place the mosaic on the skillet for about 10 minutes. I use a long pair of tweezers to push on the glass pieces while they’re heating. The truly “dry grout” method! Now, while the adhesive is still liquid-y and on the electric skillet (I didn’t plan ahead like you will. I had to remove the mosaic and put a piece of the release liner under it to catch the excess grout. ), sprinkle dry, sanded grout on top of the piece. Make sure to cover it all! I pushed down on the grout to make sure it really got in there, but I’m not sure if you need to. Turn the skillet off, and after the mosaic cools, you can knock off the excess grout. You’ll probably have to clean up here and there using an exacto or razor blade, but it’s so much quicker and easier than the traditional grouting method (not to mention less messy)!